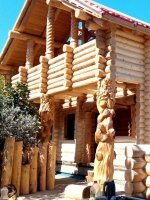 Facade carved wooden pillars are a unique solution for arranging summer cottages, bathhouses and cottages built in an ecological style. 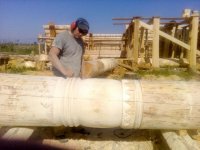 Such designs can be used to design fences, terraces, porch and wooden stairs. Made from natural wood, they emphasize the good taste of their owners and make the space even more warm and cozy. 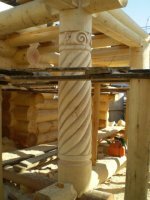 Here you can buy carved pillars and columns directly from the manufacturer. We make products according to individual design, we work with standard projects. As materials, we use only a natural array of good density and proper drying. 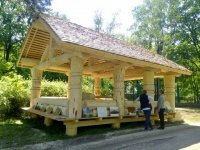 Pillars made of such wood will last you for many years, they will not rot and will not deteriorate under the influence of heat, cold and temperature changes. • spectacular appearance - they look beautiful, solid, expensive. 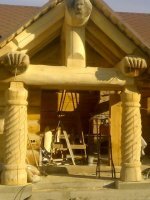 Columns and carved pillars for the porch and the stairs of natural solid wood can transform the interior of both the external and internal space of the house. They can be made in the form of balustrades, covered with patina, give them any configuration and size. Our possibilities are limited only by your imagination. You can find out the exact cost of the projects by contacting us by phone located at the top of the site, or by sending a request online. We will make a miscalculation and after agreeing on the budget we will launch the product into production. 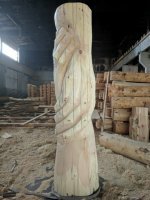 Ordering carved wooden poles for stairs from us, you buy durable and unique decor, made with all the requirements and wishes of the customer.